Today we're going to look at the smattering of neutral and class cards that have been released since my previous reviews. The expansion is going live on Thursday, the 10th of August! what are the odds it's evil? The Fallen Sun Cleric is the smaller version of the Shattered Sun Cleric. You get the same Battlecry, on a smaller body, for a lower Mana cost. 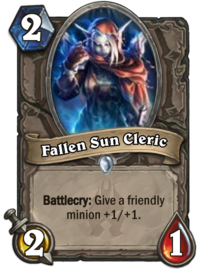 A handful of decks use Shattered Sun Cleric, and they might switch to this because of its lower Mana cost. You're probably better off running decks with stronger buffing minions that have more specific effects (such as the Rockpool Hunter, a 2/3 minion for 2 Mana that gives a Murloc +1/+1). The Fallen Sun Cleric is probably a Poor card. 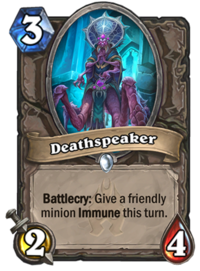 The Deathspeaker, like most Battlecry minions, has slightly poorer stats for its Mana cost. Its Battlecry is interesting, making one minion Immune to damage for a turn. This is useful for trading and creating or maintaining board advantage. I think it's a neat card, but I'm not sure it deserves more than a Fair rating. 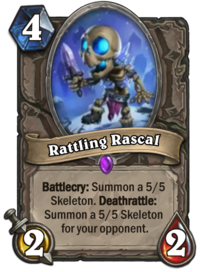 The Rattling Rascal has a really powerful Battlecry for its Mana cost, but also a really terrible Deathrattle. 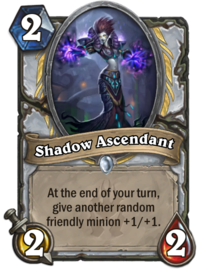 It has some uses, though: you could use it in an Evolve deck, and you can use it in a priest deck that uses a lot of Silence effects. It occurs to me that you could use it with the warlock spell Treachery: play the Rattling Rascal, play Treachery on it, then trade into the Rascal with one of your other minions to get 2 5/5 minions for 7 Mana. It's not the best play, but it is good value, and decks that don't have strong board clears would certainly struggle to deal with the minions. Because of these possibilities, I think the Rattling Rascal merits a Fair rating. 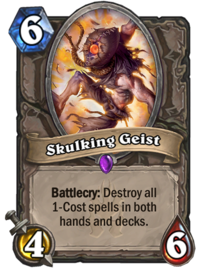 The Skulking Geist has a body that's not unheard of for 6-Mana minions. It also has an interesting Battlecry, one that could potentially gut certain styles of aggressive deck. Midrange decks that have 1-Mana minions to play in the early game will thank you for thinning their deck, though. At 6 Mana, I think this card comes too late for you to benefit from it. A 4-Mana card that had considerably weaker stats would be more suitable. As it is, this is probably a Poor card at best, although given the potential downside it probably merits being rated Terrible. Now, we'll look at the various class cards, with the exception of the priest death knight card, which I will review separately. but calling it "Purring Felhound"
would wreck its street cred. 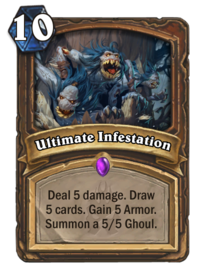 Ultimate Infestation is a doozy of a card. It might be 10 Mana, but you're getting a lot out of it. Sprint, for instance, is 7 Mana, drawing 4 cards, so normally you'd expect drawing 5 cards to cost 9 Mana. Iron Hide grants 5 Armor for 1 Mana. 5/5 minions are usually 5-6 Mana. 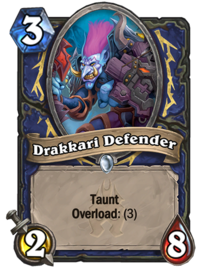 Shadow Strike deals 5 damage for 3 Mana, with a targeting restriction, while for 4 Mana, Fireball deals 6 damage, so 5 damage without targeting restriction is, I suppose, 3.5 Mana cost. All that's to say, you're getting incredible value for this card. 5 Armour gives you some badly needed healing, dealing 5 damage and putting a 5/5 minion on the board is usually a big swing, and drawing 5 cards refills your hand. It's an exceptional package, surely making this an Excellent card. Play Dead is a spell with an effect that I really like. However, it's an effect that hardly any hunter makes room for in their decks, even when they're playing Deathrattle decks. I can't really recall seeing Feign Death, Terrorscale Stalker, or Princess Huhuran played by any hunter opponent I've played, and I haven't often seen Spiritsinger Umbra played by anyone (and certainly not hunters). The hunter playstyle is usually just too fast-paced for this kind of card to be an effective part of its deck. 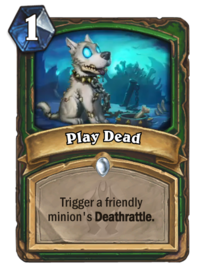 In Wild, I don't see a slow Deathrattle hunter deck playing Play Dead when it can play Feign Death. If a slow hunter becomes more viable, this card might see some play in Standard. 1 Mana does make it a lot easier to play in combination with cards, so I think it's worth a Fair rating on its own merits. 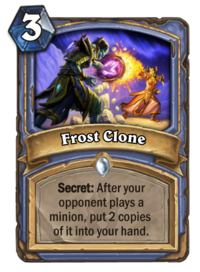 Frost Clone is a card that is like a cross between Mirror Entity and the Wild format Secret Duplicate. I don't think it's quite as good as Mirror Entity, insofar as that card gives you a minion on the board that you could either use on your turn, or that your opponent suddenly had to spend resources dealing with. The greedier your opponent's deck, the more value this card can generate. It's too slow for you to benefit when used against an aggressive deck. I think this card is Fair. I probably wouldn't have it in my deck, but I wouldn't feel bad if it came up from a spell-generating card. 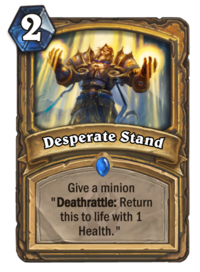 Desperate Stand is the kind of buff spell you play on Tirion Fordring or (in Wild) Sylvanas Windrunner to make your opponent wail in agony unless they have a Transform or Silence effect in hand. This spell is like the Secret Redemption, only it takes away the opponent's ability to play around it for one extra Mana. Paladin Secrets aren't that great as cards in your deck, so I'm not completely sure this card's worth having in your deck, either, and it's a dead card when you're facing Silence Priest or D/Evolve Shaman, so while I like the idea of giving my opponent conniptions when they just know Tirion will bounce right back after they kill him, I don't really think this card is any better than Poor. The Shadow Ascendant is a slightly underwhelming body for a decent buff effect that goes on for as long as this minion is on the board. It'd work well as long as you can buff its health and especially if it has a Taunt minion to buff. That being said, the 2-Mana minion spot is usually filled with Radiant Elemental and either Ancient Watcher or Netherspite Historian (along with Wyrmrest Agent in Wild format), all of which are far better choices because of their superior effect or ability to contest the board (once Silenced or bestowed with Taunt in the case of Ancient Watcher). And ongoing buffs aren't usually that powerful, anyway. This card is probably just Poor. 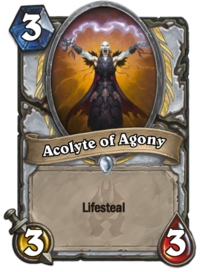 The Acolyte of Agony is a plain minion for its Mana cost (3/3 for 3 Mana), with Lifesteal making up for the lack of good stats. Despite that, I think it's a good early play against aggressive decks, especially if they can't clear it efficiently. It can act as a soft Taunt, because opponents won't want this minion trading into its board and being healed, so you can play it on curve, although it's probably better to play it on a turn you can give it a Health buff. I'm not sure it's good enough for a Good rating, but I think it definitely is on the upper end of Fair. 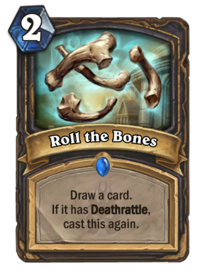 Roll the Bones gives rogue the "cast again" mechanic that druid and warlock have available so far, on a card that draws cards from your deck. Much like Wrathion draws a card, then draws more cards as long as you keep drawing Dragons, this spell keeps casting as long you draw cards with Deathrattle. 2 Mana for 1 card draw is okay, if a little undervalued. 2 Mana to draw 2 cards is solid value (recall that Arcane Intellect costs 3 Mana to draw 2 cards). If you draw 3 or more cards with this spell, you are definitely riding the value train, although you might start worrying about overdrawing. A rogue Deathrattle deck could easily make room for this card, preferring it over something like Sprint. Again, I don't think it's quite good enough to be Good, but it's at the high end of Fair because you can get a lot of mileage out of this card with the right deck construction. Northrend isn't exactly a hotbed of murloc activity (the kvaldir being a more typical coastal threat), but the Brrrloc is doing the best that it can. 2/2 isn't inspiring in a 2 Mana minion, but this is not a minion you're playing on curve. 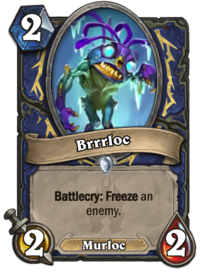 You're playing this minion for the Freeze effect to synergise with Ice Breaker and Moorabi. I don't think this card is as good at filling the role it's designed for as Glacial Shard is, but it's serviceable, and shaman has Murloc synergy (especially in Wild format with Everyfin is Awesome), especially with its next card. This card is probably Fair. There's nothing like going out on a frozen lake, sawing open a hole and dropping in a lure hoping for fish, only to pull out an angry murloc. That hasn't happened to you yet, and you've been ice fishing for fifty years, you say? I'll take your word for it here on Earth, but in Azeroth it's apparently a thing, because here we have Ice Fishing, with nary a fish in sight. This card is obviously good for pulling Brrrloc out of your deck, but you probably want to run a few other murlocs to make sure this card isn't a dead card if by some chance you've pulled out your Brrlocs. 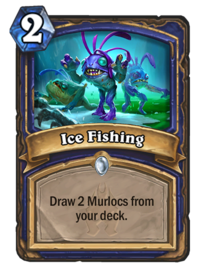 2 Mana to draw 2 cards is pretty solid value, especially in a Murloc deck where you want to be drawing Murlocs. I think this is a Good card. 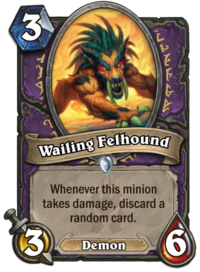 What's shaping up to be another avoidable minion is the Wailing Felhound. Quest warlock likes to discard cards, sure, but you don't want to overdo it. This minion can be good for trading or hitting face while your opponent tries to get rid of it, but the big problem is that you don't control when it causes discards to happen, unlike the cards that discard cards as part of their Battlecry. It's also harder to manipulate your hand to reduce the negative repercussions of discarding cards with this card. I don't see it becoming a staple of the deck. I could end up being wrong, but I suspect this is a Poor card. 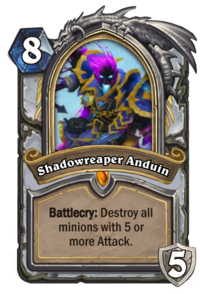 Now we come to the Priest death knight Hero card, Shadowreaper Anduin. Don't stick your hand in it. Shadowreaper Anduin is an 8-Mana card. Its Battlecry is extremely situational. You'll feel pretty crappy playing this against an aggressive deck, but pretty good when you play it against a greedy control deck, a midrange Paladin Murloc deck that gave its Murlocs Attack buff Adaptations, or any buffed Jade deck. The Hero Power changes Anduin's focus from slowing the game down by keeping his board alive, to speeding it up by burning down the opposing board (or his opponent's face). 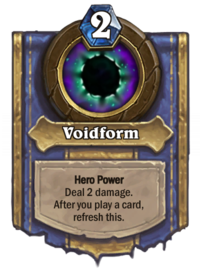 Voidform has the addiitonal advantage of refreshing whenever you play a card. Shadowreaper Anduin can work well, I think, in a Priest highlander deck with Kazakus and Raza the Chained (2 damage for 0 Mana that refreshes whenever you play a card is pretty ballin'), especially if you can combine it with card-generating effects such as Lyra the Sunshard's spell generation. The replacement Hero Power isn't nearly as good in a deck that doesn't have Raza, but it can work any time you only need to spend up to 6 Mana on one or more cards in a turn, which can come up often later in the game. While I think this death knight Anduin might see regular play in Priest highlander decks, I'm not so sure that its really strong enough to merit more than a Fair rating overall. I'm led to understand Blizzard will be dumping a bunch of cards on us on Monday, so I want to have my plate clear of cards when that happens.